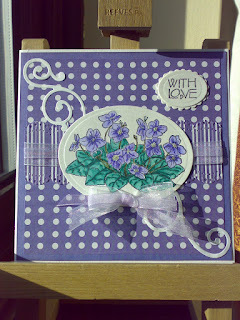 I bought this violet stamp some weeks ago, but this is the first time that I have used it. I think it's such a delicate little flower and I feel that this stamp reflects that. I coloured the image with Whispers pens and a water brush. There's just a hint of Glamour Dust in the centre of each flower. The papers are from Clare Curd's Signature Range. The flourishes are Quickutz, the sentiment is Stampin Up and the ribbons are from off the shelf... not sure of the make, just bog-standard organza. I'm off to the club soon for a spinning class (on a bike, not with a spinning wheel and a bunch of wool!) then I will be having my nails done this afternoon. Life's all go isn't it! Lovely image, and those papers are delicious!!! This is a really striking and beautiful card. Ohh Chrissie i love the colours in this, and that stamp is gorgeous. How sweet. Love your card and love the pp. Very Pretty Chrissie! Thanks for joining us for the PTW challenge!